This is a normal ultrasound of the fetus performed at 17 weeks gestation. The fetal face can be seen in the middle of the screen. 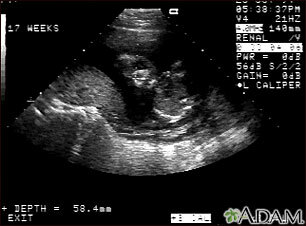 The head is tilted left toward the placenta, which can be seen as a mound in the left of the ultrasound image. Both eyes are visible, and the area of white within the eye is the lens. Other facial features, such as the nose and mouth, are also visible.